Poop Rescues can maintain your entire commercial property. Our solution is affordable. A weekly cleaning agreement can cost as low as $100 per month. We offer Every Other Week, Weekly and Twice Weekly Service, schedules. All dog waste is bagged and hauled away after each cleaning. We also can supply you with waste stations at an affordable price for all different types of needs. We provide maintenance service and install dog waste stations. We inventory and provide the bags for each station and make sure that your equipment is clean and working properly. Bids are structured based on the sizes of the common areas or areas you would like serviced. Our bid is partially determined by the size of the area but the largest factor is how much dog traffic an area gets. The longer a service visit lasts the less our time and money is spent on travel. We automatically issue discounts for larger service agreements. We will remove and haul away all waste from the dog park and santize the area with a veterinarian approved cleaning solution. If interested, please call us at 703-880-5214 for a free quote. We can install dog waste stations and provide dog waste station maintenance service (bags included). Please call us for a free no obligation quote. If you would like more information about commercial pet waste cleaning or a service bid on your Apartment complex, HOA or other property please click here to fill out the form. 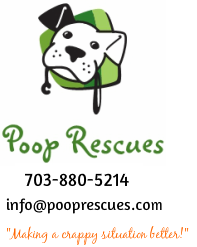 Or contact us at 703-880-5214 or e-mail info@pooprescues.com. We will submit a written bid within 48 hours of your request.